This study presents a comparative analysis of the ordinary and residual kriging methods for mapping, on a 1 km by 1 km grid size, monthly-averaged daily global radiation (H) in the horizontal surface in Andalusia (Southern Spain). The experimental dataset includes four year (2003-2006) of data collected at 166 stations. Overall, the ordinary kriging methods proved to be able to provide fair estimates: RMSE ranging 1.63 MJ m’2day_1 (6.2%) in June to around 1.44 MJ m’2day_1 (11.2%) in October. In the residual kriging procedure, we propose the use of an external explanatory variable that accounts for topographic shadows cast, and that is able to explain between 15% and 45% of the spatial variability. Based in this variable, residual kriging estimates shows a relative improvement in RMSE values ranging from 5% in the summer months to more than 20% in the autumn and winter months. Particularly, RMSE values of the residual kriging estimates ranges from 1.44 MJ m’2day_1 (5.5%) in June to around 1.31 MJ m’2day_1 (10.2 %) in October. It is finally concluded that the proposed residual kriging method is particularly valuable when mapping complex topography areas. Keywords: GIS, Kriging, Global Solar Radiation, Andalusia (Southern Spain). The interpolation techniques were the first methodologies used for mapping climate variables, such as the solar radiation. These techniques allow obtaining spatially continuous databases from isolated-stations measurements based on spatially interpolation methods. 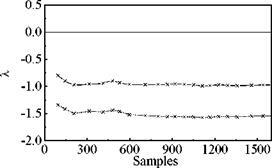 The reliability of interpolation techniques are strongly dependent on the sample size . Particularly, ordinary kriging may provide reliable estimates of climate variables, as the solar radiation, in homogeneous terrain with similar climate characteristics. Nevertheless, the reliability of the estimates decreases when the complexity of the topography increases, or when an earth-sea interface is present. In such cases, stochastic interpolation processes may not provide meaningful spatially-continuous estimates, since point-specific measurements can be affected by strong local variation. For the solar radiation, particularly, complex topography areas present a challenge. Variability in elevation, surface orientation (slope and aspect), and shadows cast by topographic features can create strong local gradients in the solar radiation that interpolation processes may not properly account for. topographical characteristics. There are different ways in which the external variables can be taken into account in the kriging process. For instance, the information coming from the external variables can be considered during the interpolation process. An example of this methodology is the cokriging. This method is advantageous when the external variable is highly correlated to the studied variable, but becomes very complex when more than one covariables are considered  Instead of including the external information directly in the kriging process, it is possible to consider it during a first step, prior to the interpolation itself. There are different denominations for this technique, as ‘kriging with a guess field’  or ‘residual kriging’ . We will use this last denomination hereinafter. Basically, in a first step, a multiple linear regression is fitted between the variable of interest and some external explanatory variables. Then, an ordinary kriging procedure is applied to the residuals of this multiple regression analysis. Finally, a map is obtained integrating both the multiple regression and the kriging results. This technique, although relatively simple, is powerful, since allows including in an easy way multiple sources of external information in the interpolation procedure that may compensates for the small sample size. In this work we present an application of the residual kriging methodology for mapping monthly-averaged daily global radiation in horizontal surface in Andalusia (Southern Spain). The ordinary kriging method is also applied, to evaluate the improvement provided by the residual kriging method. The region of study is characterized by a wide range of topographic and climatic characteristic, which allows evaluating the influence of different external variables in the interpolation of the solar radiation. The meteorological and climatic features of Galicia are monitored by a network made up by 93 weather stations, located all over the region covering the usual meteorological parameters. Ten — minute averaged data were collected for both monitoring and climatic studies. The network is managed by MeteoGalicia, the Galician weather service (www. meteogalicia. es). Currently, 25 stations provide the solar radiation measurements with Ph. Schenk first class pyranometers (Philipp Schenk GmbH Wien & Co KG, Wien, Austria) and Kipp & Zonen sunshine duration sensors (Kipp & Zonen, Delft, The Netherlands) located in the most representative sites of Galicia. These sensors are periodically cleaned and calibrated by specialized crew, following the manufacturer’s recommendations. Data are collected by dataloggers, sent to a central data server and stored in a database specifically designed for environmental data sets. Here, several filters are applied to ensure the data quality [6, 7]. Since the solar radiation network was gradually set up, eight stations count on a data set longer than five years. The main features of these stations are listed on Table 1, while geographical location is illustrated in Fig. 1. In this work, the analysis has been focused on the trend of the values of global radiation, sunshine duration and clearness index KT. Other meteorological parameters that are relevant for the solar resource characterization (temperature, relative humidity and precipitation) have also been considered. Finally, monthly and yearly values of global solar irradiation measured in the meteorological stations have been compared with the results obtained by Vazquez et al. . The clearness index has been evaluated by the ratio G/G0, where G is the ground measured irradiation and G0 is the extraterrestrial irradiation. For this purpose, a solar constant value of 1376 Wm-2 was adopted, as recommended by Davies . Astronomical relationships were obtained following Iqbal . Table 1: Main features of the meteorological stations analysed. Chaotic dynamical systems are predictable for finite time scales, but not for infinite ones. Let consider two initial states of the system with almost identical initial conditions. Their trajectories in the phase space will move apart, given a metric, at an exponential rate while moving on an attractor. This rate is described by the largest Lyapunov exponent in the system, ^max. If any Lyapunov exponent is positive, the system will be chaotic by definition. Yet, should one of them be zero, the system can be described by a set of ordinary differential equations . Figure 6 shows the d Lyapunov exponents for the differenced time series as a function of the number of samples following the suggested algorithm by Sano and Sawada . The main interest in this test is to find Lyapunov exponents greater or equal than zero. The two Lyapunov exponents exhibited by the time series are negative and thus, this time series cannot be considered coming from a chaotic dynamical system neither be described by a set of differential equations. Fig. 6. Lyapunov exponents against the number of samples. obtained from applying local linear models for prediction, of which estimations suggest that the data are best described by a linear stochastic process. This work was supported by the project ENE2007-67849-C02-02 of the Ministerio de Ciencia y Tecnologia of Spain. R. Festa, S. Jain, C. F. Ratto, Renewable Energy 2 (1992) 23. J. Boland, Solar Energy 55 (1995) 377. H. Morf, Solar Energy 62 (1998) 101. E. N. Lorenz, J. Atmos. Sci. 20 (1963) 130. L. Alados-Arboledas, F. J. Batlles, F. J. Olmo, Solar Energy 54 (1995) 183. F. Takens, (1981). Dynamical Systems and Turbulence, Lecture Notes in Math, Springer-Verlag, Berlin. A. M. Fraser and H. L. Swinney, Phys. Rev. A, 33 (1986) 1134. R. Hegger, H. Kantz, and T. Schreiber, Chaos, 9 (1999) 413. M. B. Kennel, R. Brown, and H. D.I. Abarbanel, Phys. Rev. A, 45 (1992) 3403. M. Casdagli, J. Roy. Stat. Soc., 54 (1991) 303. M. Sano and Y. Sawada, Phys. Rev. Lett., 55 (1987) 1082. J. D. Farmer and J. J. Sidorowich, Phys. Rev. Lett., 59 (1987) 845. C. Hoyer-Klick1*, H. G. Beyer2, D. Dumortier3, M. Schroedter-Homscheidt4, L. Wald5, M.
Martinoli6, C. Schilings1, B. Gschwind5, L. Menard5, E. Gaboardi6, L. Ramirez-Santigosa7, J.
Polo7, T. Cebecauer8,T. Huld8, M. Suri8, M. de Blas9, E. Lorenz10, R. Pfatischer11, J. Remund12, P.
Knowledge of the solar energy resource is essential for the planning and operation of solar energy systems. In past years there has been substantial European and national funding to develop information systems on solar radiation data, leading to the situations that several data bases exist in parallel, developed by different approaches, various spatial and temporal coverages and resolutions including those exploiting satellite data. The user of these products may end up with different results for the same requested sites. To better guide the users, a benchmarking exercise is under preparation. A set of reference data has been collected and benchmarking measures and rules have been defined. The results of the benchmarking and the feedback from stakeholders will be integrated into a guide of best practices in the application of solar resource knowledge. Access to data has been quite fragmented. Each service has its own way of access to the data and delivery format. A new broker portal based on the experience of the project Soda aims to unify and ease the access to distributed data sources and applications providing solar resource information. integrated systems has been summarised and later updated in [1,2]. From the regional point of view, the projects focused mainly on Europe or its regions, leading to the situation that several different data bases exist in parallel developed by different approaches, various spatial and temporal coverages and different resolutions including those exploiting satellite data. The users comparing information from different data sources for the requested sites may end up with uncertainty that is difficult to deal with. Large steps forward have been made for the benefit of research, renewable energy industry, policy making and the environment. Nevertheless, these multiple efforts have led to a fragmentation and uncoordinated access: different sources of information and solar radiation products are now available, but uncertainty about their quality remains. At the same time, communities of users lack common understanding how to exploit the developed knowledge. The project MESoR started in June 2007 and aims at removing the uncertainty and improving the management of the solar energy resource knowledge. The results of past and present large-scale initiatives in Europe, will be integrated, standardised and disseminated in a harmonised way to facilitate their effective exploitation by stakeholders. The project will contribute to preparation of the future roadmap for R&D and strengthening the European position in the international field. The project includes activities in user guidance (benchmarking of models and data sets; handbook of best practices), unification of access to information (use of advanced information technologies; offering one-stop-access to several databases), connecting to other initiatives (INSPIRE of the EU, POWER of the NASA, SHC and PVPS of the IEA, GMES/GEO) and to related scientific communities (energy, meteorology, geography, medicine, ecology), and information dissemination (stakeholders involvement, future R&D, communication). Yearly sum of global irradiation is compared from six spatial (map) databases: ESRA, PVGIS, Meteonorm, Satel-Light, HelioCliom-2, and NASA SSE. This study does not identify the best database, but in a relative cross-comparison it points out to the areas of higher variability of outputs. Two maps are calculated to show an average of the yearly irradiation for horizontal surface together with the standard deviation that illustrates the combined effect of differences between the databases at the regional level. Differences at the local level are analysed on a set of 37 randomly selected points: global irradiation is calculated from subset of databases for southwards inclined (at 34°) and 2-axis tracking surfaces. Differences at the regional level indicate that within 90% of the study area the uncertainty of yearly global irradiation estimates (expressed by standard deviation) does not exceed 7% for horizontal surface, 8.3% for surface inclined at 34°, and 10% for 2-axis tracking surface. Higher differences in the outputs from the studied databases are found in complex climate conditions of mountains, along some coastal zones and in areas where solar radiation modelling cannot rely on sufficient density and quality of input data. Solar energy technologies and energy simulation of buildings need high quality climatic data in the phase of localisation (siting), design, financing, and system operation and management. The choice of the best technological option depends among other things on the geographic region, as the performance of solar energy systems is influenced by solar resource and other climate parameters. Several spatial databases of solar resource information are now available as a result of European and national projects. They have been developed from various data inputs, covering different time periods, where diverse approaches have been applied. Although quality assessments of the individual databases have been performed, no inter-comparison of the outputs was performed. When comparing various data sources, differences show up which is confusing, especially to users who are not fully aware of the uncertainties and the limits of data application. Therefore, better understanding of the geographic distribution and variability of solar resource in Europe is needed. data and energy-related services for Europe: Meteonorm , ESRA , Satel-Light , NASA SSE/RETScreen , HelioClim/SoDa , and PVGIS . This list is not exhaustive, and in future also other databases may be considered, including those that cover smaller regions. We compare yearly sum of global irradiation as obtained by querying each database. Map analysis compares horizontal irradiation, while on a set of 37 randomly selected points we compare irradiation received by inclined and 2-axis tracking surfaces. The central administrative board on hydrometeorology of the Ministry of Emergencies of the Kyrgyz Republic is entitled to measure meteorological and hydrological data in the Kyrgyz Republic. There are in total 31 weather stations and 75 hydrological stations. One of the weather stations “Frunze” is situated in the west part of Bishkek. The measurement equipment is remained from the USSR period. An actual value of global and diffuse solar radiation is measured 5 times a day at 6.30, 9.30, 12.30, 15.30 and 18.30. Till 1993 daily solar irradiation on horizontal surface was measured by an integrator. This device is, however, absent since 1993 for technical reasons. Therefore, since 1993 daily solar irradiation is estimated by linear interpolation of solar radiation between 5 measured points taking into account the time of sunrise and sunset (the so-called trapezium method). The central administrative board on hydrometeorology claims the accuracy of this method to be in the range of 10% for monthly sums of solar radiation. The distribution of solar radiation is very important for choosing sites for solar power tower plants. In this paper the observed data which include solar radiation and sunshine duration of eight typical cities of China during the period 1994-2003 are used to establish a correlation equation between monthly average daily values of clearness and relative sunshine. The model is used to estimate the global solar radiation of the whole country. And it is proved to be good results (greater than 94% in most cases). The predictive efficiency of this model is also compared with some other models which are believed to be applicable globally in terms of mean percentage error (MPE), mean bias error (MBE) and root mean square error (RMSE). And the results prove that it is also better than that of those models. Key Words: global solar radiation, sunshine duration, MBE, MABE, RMSE. The design of a solar energy conversion system must always start with a study of solar radiation data at a site. One of the most important requirements in the design is the information on the intensity of solar radiation at a given location . Unfortunately, there are very few meteorological stations that measure global solar radiation. Solar radiation data are still very scarce, especially in developing countries. So we must consider other methods to calculate relative solar data for places where they are not directly measured, many attempts have been made to develop models and empirical correlations that can predict the amount of solar radiation available at a given location from a few input parameters. While it has been proved that a number of commonly measurable atmospheric and meteorological parameters such as turbidity, relative humidity, degree of cloudiness, temperature and sunshine duration taken severally or jointly, affect the magnitude of the global radiation incident on a given location. And the preponderance of data point to the fact that the greatest influence is exerted by sunshine hours. There are several correlations [2-7] to have been developed that predict the correlation between the global radiation and the percentage of bright sunshine hours in a simple linear regression form (the Angstrom-Prescott type). And some authors have also developed quadratic correlation [2, 4, 6] model and multiple linear regression. The study of this paper is to establish a linear regression form which uses the data of eight typical cities of China for estimation global solar radiation for the cities where there are no meteorological stations but have similar meteorological conditions. In the present work the solar radiation is forecasted with the non-hydrostatic model Advanced Regional Prediction System (ARPS). This model is providing its forecast weather variables for a horizontal grid of (0.12 x 0.12)° resolution with a sampling interval of 10 min. The model is simulated at the LEPTEN laboratory (Laboratory of Energy Conversion Process Engineering and Energy Technology), former LABSOLAR, at the Federal University of Santa Catarina. The simulation assimilates the data of the global reanalysis delivered by the National Center for Environmental Prediction (NCEP) . The analysis data characterize the initial condition at every 6 h, necessary to operate ARPS in actual time. The reanalysis data represent improved analysis data of the atmosphere. Both the analysis and reanalysis data are based on atmospheric measurements and their interpolations, as well as on the last forecasts of the GFS, which can accomplish forecasts until a ten days horizon. The operational forecast uncertainty includes both the analysis and the forecast uncertainty. In the present article only the uncertainty based on the reanalysis are verified. Therefore the reanalysis data, based on the GFS model, is assimilated with the regional ARPS model in a 6 h interval. For the uncertainty verification the 24 h mean value of the downward short wave radiation of the ARPS output is compared to the measured mean value of the global radiation. In a second step a statistical correction for the reanalysis uncertainty is accomplished. In the text that follows the daily energy E [Wh/m2] is equal to the daily mean radiation H [W/m2] multiplied by 24 hours. where N(h) is the number of pairs of points separated by lag distance h, Z(x) and Z(x+h) are random values at locations x and x+h. where C0, Cj, a are called nugget, sill, and range respectively. condition needed for unbiased estimator is 2 A = 1. Figures 2 and 3 show the annual variation of global irradiation and sunshine hours for the stations considered in this work. Generally, they show a regular annual variation with a maximum between June and July and a minimum in December. The only exception is represented by the station of Pedro Murias, which has a maximum in May and a relative minimum in June. As expected, the highest value of global insolation is found at Ancares, due to its altitude and rural location. The evolution of the sunshine hours shows a similar trend, with maxima occurring in summertime and minima in winter. Table 2 summarizes these results. Having a look at the mean values of insolation and sunshine hours, Corrubedo has the highest values. It should be noticed that this site, which is located at only 38 km west from Lourizan, has mean sunshine hours and insolation significantly higher than Lourizan, 1 hour and 2 MJ m-2, respectively. The two stations located in an urban environment (Lourizan and Ferrol) are characterized by similar levels of insolation and sunshine hours. On table 3 are represented the main features of the yearly and monthly mean values of temperature, precipitations and relative humidity. The trend of the temperature is similar in all the locations, with maxima in August and minima in February. Table 2: Monthly and yearly averaged daily values of Insolation and Sunshine Hours in the stations. channel into the outfall of Mino river and ascend to the slope of the local mountain range, Sierra do Galineiro. In all the stations, maxima occur in October and minima in summertime. Precipitations in the stations analysed. The monthly averaged daily data of KT are depicted in Fig. 4 for five stations. It can be noticed that the station of Ancares is the one with the highest values of the index all over the year; it can be explained because of its altitude, rural environment and relatively cloud-free atmosphere. These values have a maximum in summertime. humidity (77% yearly average) and the highest value of temperature (table 3). These features suggest that low values of KT are produced by anthropogenic aerosols, generated by local factories and urban pollution. The station of Ferrol, despite of its suburban location, close to a sea port, has values of KT higher than Lourizan, due to the presence of winds that clean up the atmosphere from aerosols and fogs. Yearly and monthly averaged daily values of global irradiation collected in the meteorological stations were compared with the averaged values derived from satellite images and collected in the Solar Atlas of Galicia . 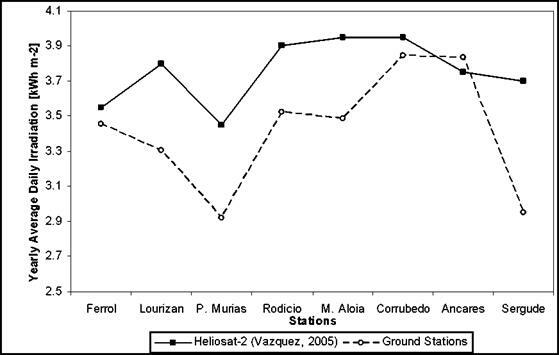 Figure 5 shows, for the stations analyzed, the distribution of the yearly averaged daily values measured by pyranometers at five stations versus the estimated values by Vazquez et al. . Global irradiances estimated from satellite images overestimates the data collected by the meteorological stations in every location, except in Ancares. In three cases (Ancares, Ferrol and Corrubedo) the agreement between ground and satellite is quite good, with relative differences less than 3% (Table 4). In the other sites, differences are higher, ranging from 10.7% (Alto do Rodicio) to 25.3% (Sergude). Relative differences in the monthly averaged daily values are greater, up till 76%. Mainly, overestimations by ground measurements occur during winter. The reason for these disagreements may be found in the normalization of the satellite data adopted by Vazquez et al. . To obtain monthly averaged daily values, the authors apply only one coefficient for the entire region, instead of dividing the territory in areas characterized by similar climatologic features and calculating different normalization coefficients for each area. In their work, Vazquez et al. , compare their results only with one station, obtaining a very good agreement. For that, they assume the goodness of the results achieved for the entire region that is, as previously stated, characterized by complex topography and high climatologic variability. of global irradiation in the location analysed. The evaluation of the solar resource in eight sites of Galicia has been carried out for the period 2001-2006. The analysis of global irradiation, sunshine hours, clearness index, together with other meteorological parameters — precipitations, relative humidity and temperature — allowed a characterization of the solar resource in this region. Monthly averaged daily values of global radiation and sunshine hours point out the complex climatology of the Galician territory. In an area of less than 30.000 km2, distributed over 2° of latitude and longitude, differences in the yearly mean daily values of global irradiation of more than 3 MJm-2 per day were found between the locations considered. This range of variability in the values of global irradiation is comparable to that of Germany (Meteonorm; Bern, Switzerland). In the same way, yearly averaged daily values of sunshine duration show differences of almost 2 hours per day between the sites. The analysis of precipitations, temperature and relative humidity, combined with the study of solar radiation, evidence the presence of persistent fogs in particular zones of Galicia. The station of Pedro Murias represents the most remarkable example. In the same way, the analysis of the solar radiation combined with the mean values of precipitations points out that extremely rainy areas, as that represented by the station of Monte Aloia, are not necessarily associated with low insolation. 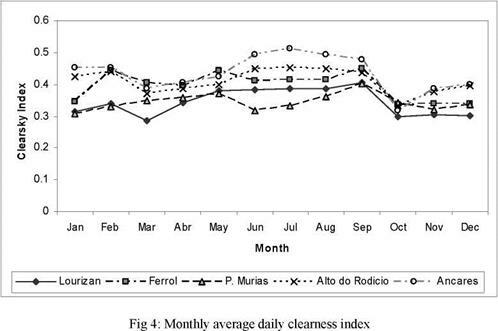 The complexity of the Galician climate comes also out analysing the mean values of the clearness index: while the highest values are found in high elevation sites, as a consequence of a clearer atmosphere, the lowest values occur in Lourizan and Pedro Murias due, respectively, to the urban pollution and to persistent fog episodes. The comparison of solar irradiation ground measurements vs. satellite observations gives the opportunity for making several remarks. The solar irradiation maps obtained by Vazquez et al. evidence two different trends: a) the incoming solar radiation increases with the decreasing latitude and b) coastal zones receive more radiation than the inner nearby areas. differences are found in Ferrol and Pedro Murias, that have similar geographical features. In these areas, Vazquez et al. found differences of 0.36 MJ m-2 per day. The stations of Ferrol and Alto do Rodicio, located respectively in the coast and in the interior, have similar mean values of irradiation even they are separated by 1° in latitude. The highest levels of radiation are found in Corrubedo and Ancares, located at the same latitude, but respectively on the western and eastern edges of Galicia. All these facts drive to the conclusion that the distribution of the solar resource in a region such as Galicia cannot be explained without the support of other climatologic and topographic features. The present work was intended for characterizing the solar resource in eight sites of Galicia over a period of 5 years. In the future, the data record will increase also due to the installation of 17 more first class pyranometers and 30 pyranometers with Photovoltaic sensor. This will allow a more detailed characterization of the solar resource in time and space. Due to the complex topography and climatology of Galicia, this will not be enough to obtain solar maps of the region since, in these cases, interpolation techniques do not provide sufficiently reliable results . However, data from this solar radiation network will represent a very important tool to validate and calibrate the methods to estimate the solar resource. Meteorological dataset provided by MeteoGalicia (Xunta de Galicia) from its web page is acknowledged This work was partially funded by Galician R&D Programme under project 07REM02CT. Institute Enerxetico de Galicia. Enema solar fotovoltaica na comunidade autonoma de Galicia. Conselleria de Inovacion, Industria e Comercio. Xunta de Galicia; 2003. Font Tullot I. Atlas de la radiacion solar en Espana. Instituto Nacional de Meteorologia, Ministerio de Transportes, Turismo y Comunicaciones. Madrid, Spain; 1984. Vera Mella N. Atlas climatico de irradiacion solar a partir de imagenes del satelite NOAA. Aplicacion a la peninsula iberica. PhD thesis. Univ. Politecnica de Catalunya, Barcelona; 2005. Vazquez Vazquez M., Santos Navarro J. M., Prado Cerqueira M. T., Vazquez Rios D., Rodrigues Fernandes F. M. Atlas de radiacion solar de Galicia. Universidad de Vigo. Vigo, Espana; 2005. Rigollier, C., Lefevre, M. and Wald, L. The method Heliosat-2 for deriving shortwave solar radiation from satellite images. Solar Energy 2004; 77: 159-169. Salson S., Souto J. A. Automatic weather stations network of the department of environment of Galicia: data acquisition, validation and quality control, Proceedings of the 3rd international conference on experiences with automatic weather stations, Torremolinos, Spain; 2003. Pettazzi A., Souto J. A., Salson S. EOAS, a shared joint atmospheric observation site of MeteoGalicia. Proceedings of 4th ICEAWS — International Conference on Experiences with Automatic Weather Stations, Lisbon, Portugal; 2006. Davies J. A. Validation of models for estimating solar radiation on horizontal surfaces. Report available from the IEA, Downsview, Ontario, Canada; 1988. Iqbal M. An introduction to solar radiation, Academic Press, San Diego, CA; 1983. Instituto Nacional de Meteorologia. Guia resumida del clima en Espana 1971-2000. Instituto Nacional de Meteorologia, D25.3, Ministerio de Medio Ambiente. Madrid, Espana; 2001. Batlles F. J., Martinez-Durban M., Miralles I., Ortega R., Barbero F. J., Tovar-Pescador J., Pozo — Vazquez D., Lopez G. Evaluacion de los recursos energeticos solares en zonas de topografia compleja. XII Congreso Iberico y VII Congreso Ibero Americano de Energia Solar. Vigo, Espana; 2004.